Want to know a secret? My projects don't always go as planned. In fact, many completely bite the dust. 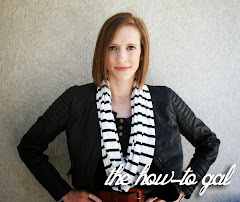 Let me share with you...the purple dye disaster. I found a beautifully peach dress at a thrift store that I wanted to refashion like I did with The Red Dress. 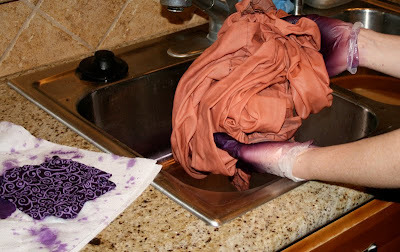 However, peach isn't my color, so I was going to dye the dress purple first. I purchased the dye, prepped the dress and agitated the dye/dress/water mixture for 1 hour (just as it says to do on the back of the dye). But due to my excitement to see the pretty purple, I didn't read the back of the dye where it says polyester is not an ideal fabric and will most likely not take the color. 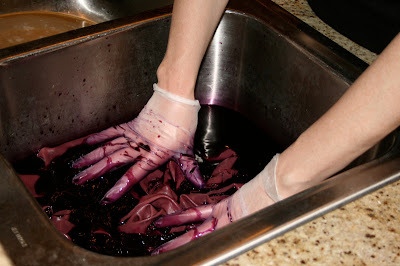 Thus, when I rinsed the fabric with cold water, I saw all of the purple dye leave the dress and head on down the drain. It was a gorgeous color though, see the fabric to the left and my gloves? That was what color the dress was supposed to be! I actually really like the color it turned out to be... but you would have to be of African American decent for it to really look good on the skin. Oh man...that's just frustrating. The purple looks like a divine color too.